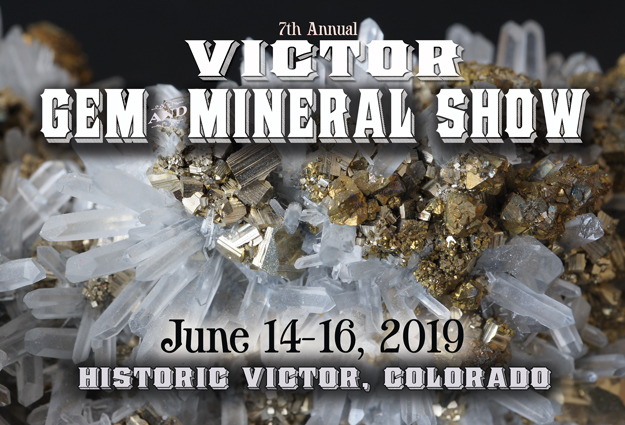 The seventh annual Gem & Mineral Show sponsored by the Southern Teller County Focus Group (STCFG) in Victor, Colorado will be held June 14-16. The event will be held in downtown historic Victor and is open and free to the public. The show will include vendors from across the state selling Colorado dug minerals. Items for sale will include polished gems, hand-crafted jewelry, rough slabs, specimens, cabochons, geode breaking, Cripple Creek & Victor Mining District gold ore specimens, Burtis Blue Cripple Creek turquoise, and more. There will also be gold and gem panning at the Victor Lowell Thomas Museum. Show hours are from 9 to 5 each day. Watch for more info on the 2019 show. For more information on the STCFG or this event, email stcfg@victorcolorado.com, or call 719-689-2675. Thanks to Newmont Mining Corporation, City of Victor, and Victor Elks Lodge for the use of their property for this show.